Welcome to the 2017 edition of Earshot’s juried series, Jazz: The Second Century. Early in June, a listening panel of four convened to review the artist entries and engage in the difficult but rewarding task of selecting ensembles for this year’s series. Earshot Jazz thanks all the unique and enterprising musicians who submitted their work for consideration. This series – presenting Seattle artists, selected by a peer panel, performing original work in a concert setting – is a continuation of the very first programming initiative of the Earshot Jazz organization, and embodies one of our core values. Earshot’s first concert series, New Jazz/New City, was mounted in the New City Theater, now the Richard Hugo House, on Capitol Hill in 1986. The series has continued each year since: as New Jazz/New City, the Earshot Spring Series, Voice and Vision, and now Jazz: The Second Century. From the core of this series – a question about the expansion of conventions of jazz – one might expect a tendency to grandiose re-invention. Instead, the series is a current, subtle, perhaps refreshing, un-sentimental look at our Emerald City’s engagement with this diffuse, vibrant art form. Thanks again to our panelists, who helped curate these concerts, and to audience members who support them. Bassist Mat Muntz and vocalist Astrid Kuljanic seek to create a new kind of concert experience within the jazz idiom. Through their careful curation of standard repertoire and the implementation of live electronic performance, Muntz and Kuljanic transform conventional jazz sets into immersive soundscapes. 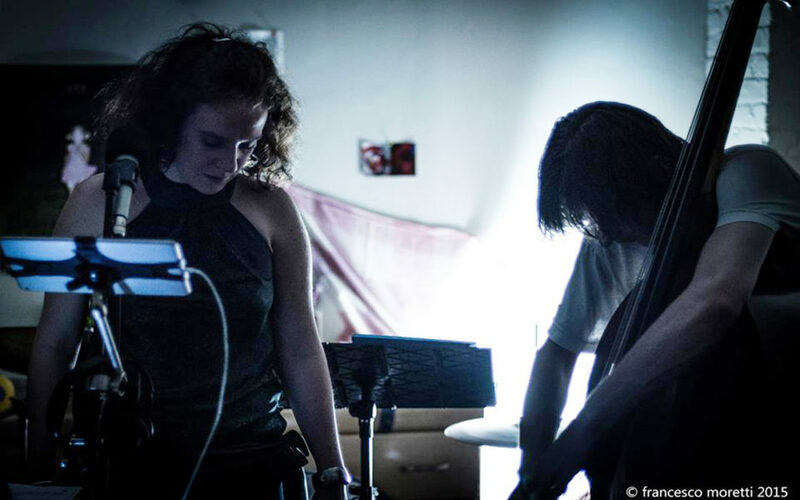 Kuljanic’s command of musical software allows the duo to manipulate sounds made in the moment – with no prerecorded samples – into arrangements and improvisations. The band grew out of a solo electronic music project that Kuljanic had developed while studying at Manhattan School of Music. Kuntz approached Kuljanic after hearing her live electronic arrangements of Ornette Coleman songs and microtonal Croatian folk music and asked to form the band. Since then the two have collaborated on arrangements, selection of repertoire, and sound design, as well as finding unconventional spaces in which to perform. Ramen Trio uses the combination of composition and improvisation in order to make music in the moment and hopefully capture the listener’s imagination. Comprised of veteran Seattle musicians Jay Weaver (drums), Doug Lilla (bass), and James DeJoie (clarinet, bass clarinet), the Ramen Trio blurs the line between the written and improvised material. The trio sometimes improvises on forms, but also relishes making up a form as they go along. Their interplay depends on focused listening, and any member may “float to the top” at any time. Both DeJoie and Lilla contribute original music that mixes written material with improvisation and covers a wide swath of possibilities. They look to the past, present and future in hope of displaying their humanity through the language of music. Jay Weaver and Doug Lilla first met when they played in Al Hood’s Aspects back in the 20th Century, and discovered their shared music interests. After a long period of each musician going down various paths through life, they began playing together again a few years ago. James DeJoie has joined forces with them in this new trio which seeks to make music live and breathe through composition and improvisation. Guitarist/composer and third-time Second Century artist Gregg Belisle- Chi’s “Book of Hours” project began three years ago, during his first year of graduate school at the University of Washington. With a goal to learn and explore as much as he could in the realm of composition, Belisle- Chi took it upon himself to compose a whole set of music for one of the ensembles he played in, under the direction of his mentor Cuong Vu. As he was listening to a lot of classical music at the time, including Beethoven, Bach, Schoenberg, and Charles Ives, he and began noticing a trend of Mass settings, a form of sacred music composition specifically for voices. sax, tenor sax, and two trumpets. Since then, Belisle- Chi has re-orchestrated the material several times, allowing more room for improvisation each time, and adding a previously unrecorded solo guitar piece. Belisle- Chi performs “Book of Hours” with Seattle musicians Daniel Salka (keyboards), Mark Hunter (bass), and Thomas Campbell (drums). Tickets and more information about the Jazz: The Second Century series available at earshot.org.